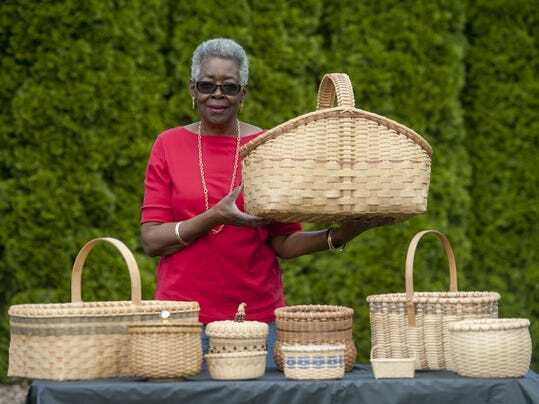 In 1994, Ethel M. Gill learned basket making from a co-worker, and hasn’t looked back. It was like a match made in heaven that combined her eagerness to learn something new with a natural talent for weaving rattan and seaweed into functional pieces of art. Gill, who was already skilled at crocheting, sewing, embroidery, needlepoint and cross-stitch, said, “After learning, I lost my mind, and didn’t do anything else for about 15 years!” Her basket weaving later led to flower arranging as a way to fill some of her beautifully hand-woven vessels. The Farmington resident admits that learning basketry was rather difficult in the beginning. “I didn’t know what I was doing, but after I knew I wanted to do this all the time, I found waterproof Band-Aids to wrap around my cuticles. They also have a lot of tools you can use to push the material. In the beginning I was using my nails like they were tools.” She believes it’s all “a matter of technique” and keeping the material wet. These days, Gill not only sells her baskets, with average prices ranging from $40 to $125 each, she also shares her skills by teaching others at her church, Scott Memorial United Methodist Church. Fees are typically $15 per student, which includes materials, and reservations are required. She charges $25 per person for groups of four to six wanting a more personal class in their home, community room, church or elsewhere. Supplies are provided, and the class will be anywhere from three to four hours, depending on the project and everyone’s arrival time. Participants typically leave with a finished project. Despite her passion for basket weaving, Gill believes it’s a dying art, especially in this area. “When I first got into basket weaving, there were several stores that sold supplies and offered classes. Today, most of the stores are out of business. You can still buy basket weaving products, patterns and tools online. Basket weavers continue to meet at each others’ homes, churches, etc. Gill won second place in two basket weaving contests at Plymouth Reed & Cane Supply in Plymouth. She designed the patterns for her winning entries. Gill, who accepts custom orders, will have a collection of her basket creations available at the Town Peddler (35323 Plymouth) in Livonia, beginning Sept. 1, just in time for early holiday shopping. Contact Ethel M. Gill at (313) 530-5393 or creativehands517@yahoo.com.